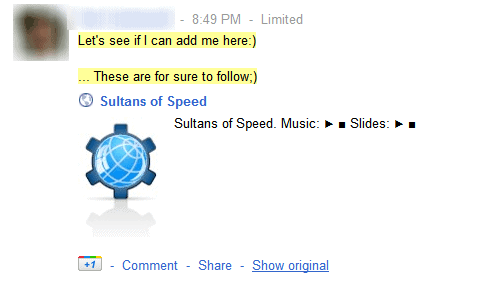 I have been using Google's new social networking site Google Plus ever since I received my invitation. To be honest, I have been spending more time on the site than I have on Facebook or Twitter combined. That's still not much compared to social networking geeks who spend hours on those sites. Still, I use it and have encountered posts on the site regularly that are in a language that I do not understand or barely understand. That's a issue sometimes especially when posts look interesting. This can be the case if a screenshot is posted along with the message for instance. Google has just released a Google Translate version for Google+ for the Chrome browser. The extension saves users from having to open a translation service such as Google Translate to translate the post to another language. The extension adds a Translate link in the "+1 Comment Share" line on all posts on Google Plus. Here are two screenshots that demonstrate the extension's functionality on the Google Plus website. It feels a bit strange that the Translate link is shown on every post on Google Plus, even if the post is in the user's native language. Then again, this is probably the resource friendly way of adding the functionality, as it would take some processing power to parse the page for foreign language posts. Translations are instant without page reloads which is the optimal solution for on-page translations. The extension displays translated text with a yellow background on the Google+ website. The color of the background can be changed in the extension options. 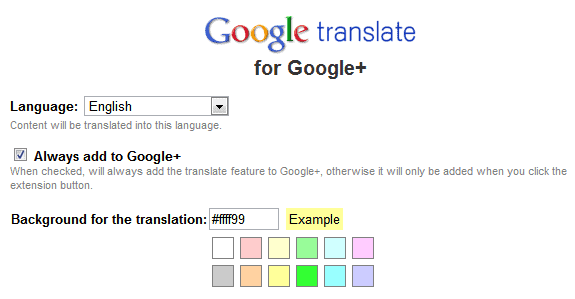 Chrome users can pick a different background with a click on one of the colors in the options or by entering the color code in the background for the translation field. It is furthermore possible to deactivate the translate link by default, and add it only to the Google+ page when the extension button is clicked on. The button is automatically placed on the right side of the Google Chrome address bar. And, there is obviously an option to select the language that you want the posts to be translated into.